Rick Norris posted this old video on his website from a 8mm movie he took during racing at Road Atlanta in August 1977. It shows David Macintosh driving his mid engine Corvair with a big block Buick engine. David won the race. I know nothing further about the car, but perhaps our members would enjoy seeing it. Can we post this on our website? Can we set up a Special Feature page to highlight videos like this? If we get some recent footage from current members, it would exciting to post those videos for our members to see. We may be able to encourage a new generation of Corvair racers in vintage racing events. Another video from Rick Norris showing Mike Levine at Road Atlanta in 2010. This is an exciting run. You can watch Mike eat up all the Mustangs, Porsche's and Vettes in his hot Corvair Conversion. He passes the Vette near the end, but the Vette recatches him and barely beats him to the finish. I have owned this car since the early 1980's. It was a lifetime dream to own and build this car. This car is beautiful. From a distance it appears as a stock Corvair with a few modifications. However, it is far from stock. This car is also not a luxury car. It is more in the lines of a race car for the street. The car has been driven less than 200 miles during my ownership. The body was completely restored about 10 years ago. The body panels were replaced with fiberglass panels. The only steel that remains on the car is the doors, rear cove, and roof. The wheel wells, trunk area and floors have all been done in aluminum. The engine is a small block Chevy from a 1966 Chevy II factory rated at 275 hp. The car has been sitting for a few years and does have a few small leaks. I did just replace the carburetors with new Holley 600 with vacuum secondaries. It has a Saginaw 4 speed. One last thing, It's FAST! Paul Siano stretches his legs! This video contains lots of V8 Corvair photos. A video showing Sam Buck's Kelmark V8 Corvair prior to his purchase of the car. Mike Myers with Dennis Gage on "My Classic Car". Richard Miller sent this video from the autocross at the 2015 Knoxville Convention. 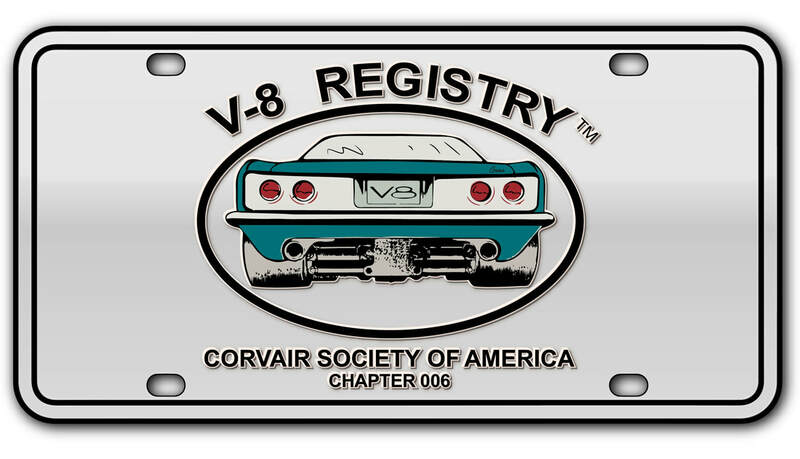 It features a number of V8 Registry member's cars.